So far the 2003-2004 storm season has not played by the usual rules. Normally early December in the southern inland of NSW is dry and moisture starved, with just the odd one day passing trough lines. However the period from the 1st December to 4th December saw a persisting inland trough with abundant moisture. Models for the 2nd indicated CAPE around 2400-2500 and Li's close to -8C, nothing shabby at all. On the negative side the moisture was too abundant through the middle layers, and middle to upper level winds were not as good as further southwards. The coast where I live was under the influence of high pressure ridging up the Tasman Sea, so a day chase in my area was out. To see storms I would have to travel and do an overnight stay, but I almost blew the chase before it even started. At midday at the town of Yass I decided to be kind to my car and add a little oil. About 10 minutes down the road and I wondered what kind of sticky insects were splattering on my windscreen. I looked down at the bonnet of the car and to my horror saw a large streak of oil making its way towards me. I pulled over and lifted the bonnet only to be sprayed with hot engine oil, the oil cap had come off. Lucky I was near a small town and after 30 minutes during which I mopped up as much oil as possible, washed the car's windscreen, changed my own clothes and refilled the engine oil I was again on my way. 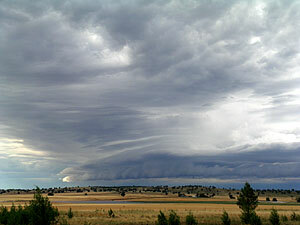 Around 2pm the first weak cells had grown into a storm near Junee. I disregarded these and pushed further south and west. Just north of Wagga at 3pm a much stronger storm developed ( see top pictures ) and I managed stayed ahead of the storm until the outskirts of Wagga. I had no road options but to enter the storm. Extremely heavy rainfall and strong winds were the main feature of the storm as the city was plunged into a eerie 3.30pm twilight. It took me the next 45 mins to finally break out into relatively clear air again. I had the choice of following the Wagga storm further SE, or pursuing a line of convection that was in my estimation about 100kms to my N/NW. I choose the latter option as I like to have some sunshine around my storms ( see picture below ). A line of storms N/NW of Lockhart. A detached gust front, beautiful but not severe. As I neared this line north of Lockhart a large detached gust front came into view, I looked quite lovely against the golden wheat fields. To the north was still quite dark and active looking. 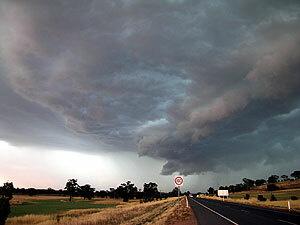 Near the town of Griffith I encountered another severe storm. The rainfall rates from these storms was incredible. A two photo panorama of a rain monster, this storm at Griffith caused flash flooding was electrically quite active. The town of Griffith was affected by flash flooding. I looked forward to a night of lightning, however by dark lightning had reduced to odd flashes, and by 10pm was dead. I made a few errors today, but lessons were learnt in the process. I slept in, but this was not a mistake, in hind sight if anything I should have slept in longer. A visit to the local Griffith library confirmed that today should be similar to yesterday. At 10.30am there was a weak line of congestus a long way west. 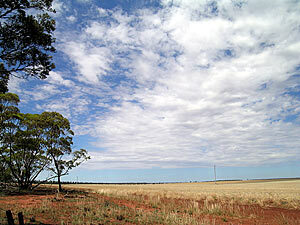 I decided to kill some time by driving half way to the remote town of Hillston. I did this and had a read and rest in the shade at Goolgowie. By midday and the line of congestus had barely moved, in fact there was no convective cloud at all to the south and east. I decided to drive even further west to Hillston itself. 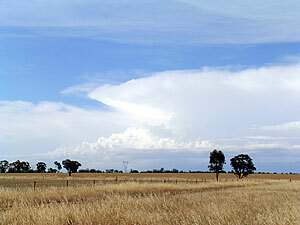 It was now 1pm and a slight panic was setting in, some towers were going up northwards towards Condobolin and a storm could be seen far to the NE, I estimated 200kms as the land was flat and air clear. A check at Hillston library revealed this storm was indeed 200kms NE and was lightning active. But these storms were in an area of no shear, lower CAPE, but slightly better moisture. Meanwhile local conditions had not moved. I made a foolhardy decision that if local conditions had not developed more by 2pm I would pursue the storms 200kms eastwards. And that is exactly what I did. I took a good three and a half hours to finally catch the weaker storms, and weak pulse storms is exactly what they were! 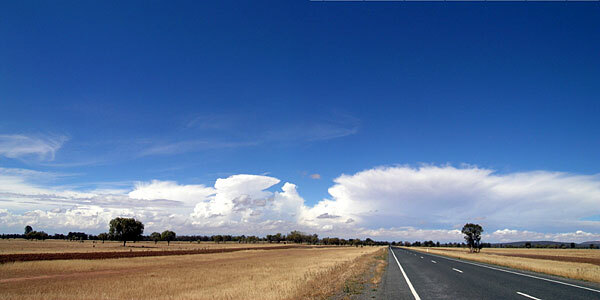 Around 4pm monsters again broke out south and east of Hillston and Griffith. Lessons: Have patience. Is chasing pulse storms worth laying down serious road mileage for. Remember that as you creep westwards without changing time zones your heating ( real sun ) time will be later ( Hillston is on the same time zone as my home, yet is several hundred kilometres westwards in a straight line. 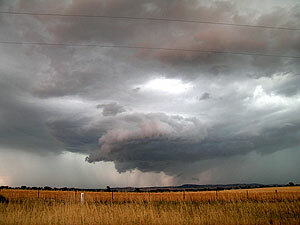 Australian Sky and Weather has photos and information of the storm that affected Melbourne on teh 2nd and 3rd December. Stormplanet also has a detailed report of the Melbourne vent.